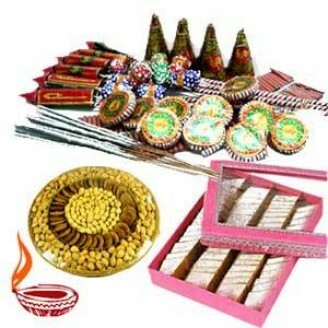 This gift hamper is specially designed for this Diwali gifting. It contains: 1 Kg Dry Fruits box contains: 250 grm each of kaju, badam, Kishmish, pista. 1 kg kaju Sweets box: Kaju samosa, kaju gunjia, kaju laddo, kaju roll packed in royal designer box. Crakers worth Rs 300/- For any query please call our customer support number +91 9654 66 33 55. Or write an email to giftcreation@giftjaipur.com.